Our master bathroom came with some serious faux finish on the walls. 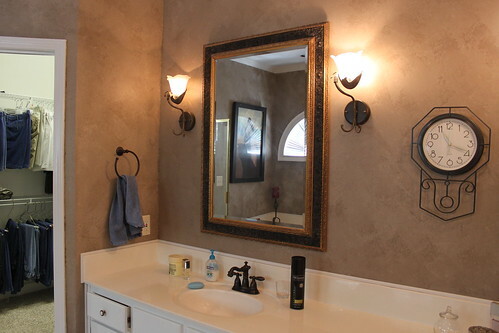 Somebody somewhere spent a lot of time stippling and sponging and ragging these walls into faux finish perfection. Having spent some time faux finishing walls in the past, I really appreciated the effort that must have gone into that room. 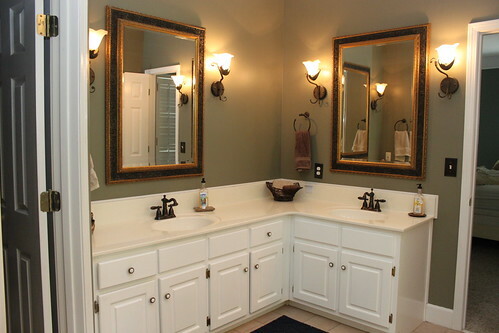 But, J and I just were not feeling it for our bathroom. It was way too dark and way too HGTV/Trading Spaces circa 1999 for my tastes. So while the painters were de-beiging the bedroom we had them un-faux the bathroom too. I went with SW Connected Gray in there. 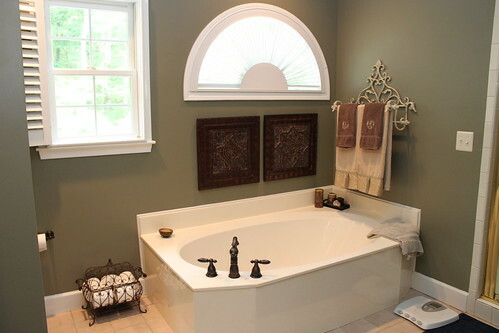 It was the color of our master bathroom at our old house, so it was comfortable and familiar to me. Much better! Now I need to figure out a way to turn my white cabinets into mahogany and I’ll be all set! love the “new” color. 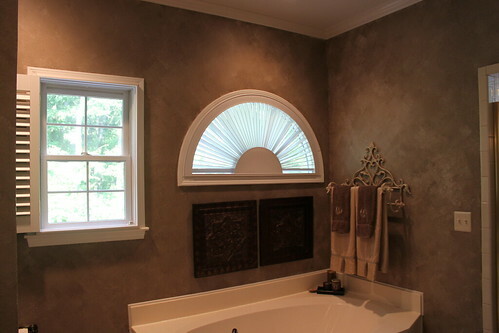 my master has a similar semi-circle window above the tub and i really don’t like it. yours looks way better because it is outlined in molding. mine on the other hand is not. i was curious if you were going to leave yours ‘as is’ or if you had any other window treatment ideas up your sleeve? This is such a great color – and the white now pops. Faux is mostly tragic. Yeah, I said it. @karisa, I don’t have any other plans for mine right now. It came with a custom blind treatment that works for me. I hope you can find something that you love for yours! @Jamie and Scarlett– Thanks guys!